Goodwell, Okla. — Oklahoma Panhandle State University graduate Cody Kendall can now add a world championship title to his list of accomplishments after he and his team from Beachner Brothers Livestock won the 23rd Annual World Championship Ranch Rodeo (WCRR) in Amarillo, Texas this past November. In addition to earning the championship title, Beachner Brothers Livestock won the team penning and wild cow milking events at the WCRR. Beachner Brothers Livestock was established in southeast Kansas in 1960 by Corky, Jerry, Bob and Bill Beachner. Cody’s dad, Calvin, who now manages the ranch’s cow-calf operation, has worked for them since he was in high school. Cody’s brother Caden and his friend, Ty, who Cody said is like a brother, joined Cody and his dad to round out the team. Teams must qualify by winning one of the 22 sanctioned rodeos held throughout the year. 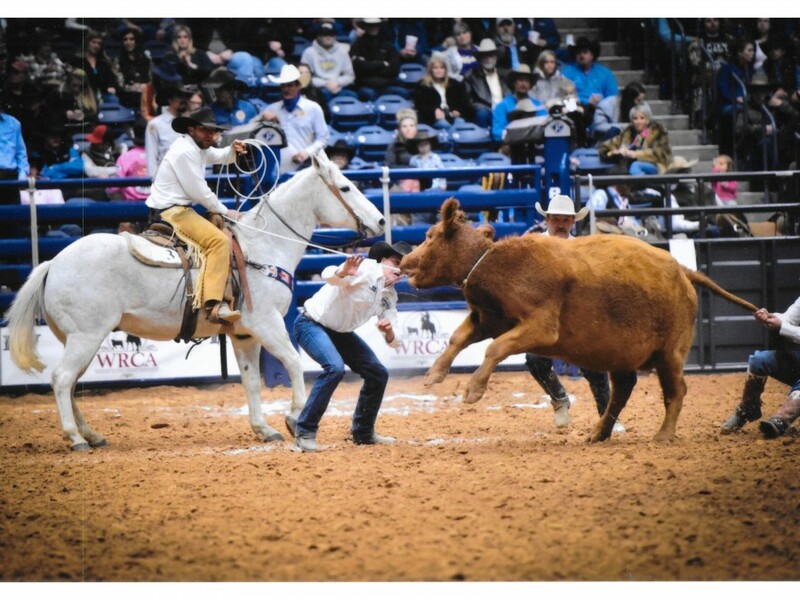 Each qualifying team competes in five different events including branding, stray gathering, team penning, wild cow milking, and ranch bronc riding. The teams are scored on a point system for each event and the team with the most points is crowned the winner. Among his winnings, Cody collected WCRR Horse and Top American Quarter Horse titles for his horse he was riding Little Tee J Paul. He rode this same horse when competing in the team roping during college and has owned him since Little Tee J Paul was young. Originally from Saint Paul, Kan., Cody found his way to Goodwell on a rodeo scholarship after he attended junior college at Fort Scott Community College in Kansas. Kendall graduated from Panhandle State in May of 2018 with a Bachelor’s degree in Animal Science. Cody competed in both the team roping and the saddle bronc riding for the Panhandle State rodeo team and he believes being around Coach Robert Etbauer and the whole team really helped him.